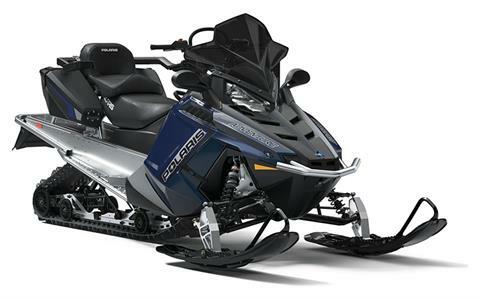 Best sled for riders that need a do-it-all snowmobile for versatility at a great value. PRO-RIDE® CHASSIS: The INDY® Adventure 155 is built on the PRO-RIDE® chassis that is 300% stiffer for precise, intuitive handling. The ideal choice for a nimble handling sled that is fun to ride. ARTICULATED REAR SUSPENSION: The 155 rear suspension features an articulated rail for the best off-trail snowmobility and to prevent trenching when backing up. The rail tips up at the rear so the track can ride over obstacles and is easier to back up. PRO-RIDE® RMK® FRONT SUSPENSION: Nimble yet stable, the adjustable RMK® front suspension delivers superior ride and handling on- and off-trail. HIGH-FLOATATION 155" TRACK: This 15" x 155" x 1.6" Cobra track features deep lugs with a cupped design to deliver outstanding off-trail performance. The lugs provide great deep snow traction and their stiffness ensures great on-trail performance as well. 550 FAN ENGINE: The proven, durable, fan-cooled 550 snowmobile engine provides reliable performance at a great value. CVTECH POWERBLOC50 / INVANCE CLUTCHING: All INDY® models that feature the 550 Fan Engine use the CVTech PowerBloc50 drive clutch paired with the Invance driven clutch. This clutching delivers smooth engagement, enhanced low-speed drivability and quieter operation. These durable clutches have a maintenance-free design and are easy to tune while installed on the sled. ELECTRIC START: Start your sled with the turn of a key. Nothing beats the ease and convenience of electric start. LOCK & RIDE® CONVERTIBLE PASSENGER SEAT: The modular design seat allows 2-up passenger flexibility when combined with the Adventure rear rack system. ADVENTURE CARGO SYSTEM: The Adventure Cargo System features a rear aluminum rack that can hold cargo and the innovative Lock & Ride® Saddlebags. These spacious bags can be installed or remove in seconds, without tools. They lock securely onto the sides of the rack and provide convenient, protected storage that expands every rider's travel options. INDY® PRO-RIDE® SEAT: A wider surface right where a rider sits provides enhanced comfort during long days on the snow, and the seat design allows easy transition between seating and standing positions. RYDEFX® MPV SHOCKS: RydeFX® MPV Shocks provide a great foundation for ride and handling with the PRO-RIDE® chassis. TALL WINDSHIELD AND WIND DEFLECTORS: Less wind means a warmer ride. Designed for excellent coverage, this tall windshield directs wind and snow up and around the rider while the side panel-mounted wind deflectors force wind and snow outward away from the rider. EXTREME FRONT BUMPER: Lightweight, aluminum front bumper features protection for wherever your INDY® Adventure 155 takes you. ONE-PIECE HANDLEBAR: The one-piece handlebar features clean, durable construction. It enhances ergonomics with full-length grips that improve comfort and control, and the heater elements extend to the ends of the bar for greater hand comfort. HANDLEBAR AND STEERING POST ANGLE: The INDY® Adventure 155 design has a 15 degree flatter steering post angle developed for sit-down and standup riding comfort and flexibility. PRO-FLOAT SKIS: The strong and lightweight PRO-FLOAT skis provide outstanding off-trail flotation and unmatched on- and off-trail steering and control. Their unique dual, stepped keel design provides more responsive deep snow handling as well as outstanding trail performance. The upturned rear edge accommodates backing up over obstacles and the serrated top of the ski provides traction for a rider's boot.